Join Hideki Amasaki (Ama), chef, Two Chaps, Marrickville, for a hands-on udon noodle workshop. 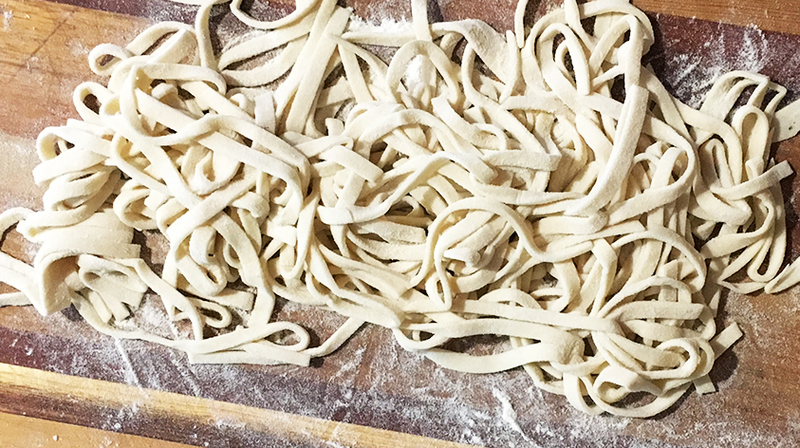 Participants will learn how to knead, roll and cut their own udon noodles to take home and cook. Amasaki will also demonstrate how to cook a delicious vegetarian vegemite-based broth for everyone to enjoy with fresh-made udon. Hideki Amasaki began his interest in cooking as a teenager living in Japan. Motivated by his mother’s bland-tasting fried rice, Ama sought to learn the art of making a tasty, successful fried-rice while working as a dish washer in a Chinese restaurant. After moving to Australia in 2005, Ama worked in various kitchens including The Cut Grill & Bar, The Wine Library and Pinbone, and completed a cooking course at TAFE to further develop his culinary skills. In 2015 Ama joined the team at Two Chaps – a café and bakery with a sustainable, vegetarian approach to all aspects of operation. Ama is drawn to Two Chaps’ commitment to ethical food production and consumption.